You might have seen my line up of events on Friday . . .
And my expectations were exceeded! 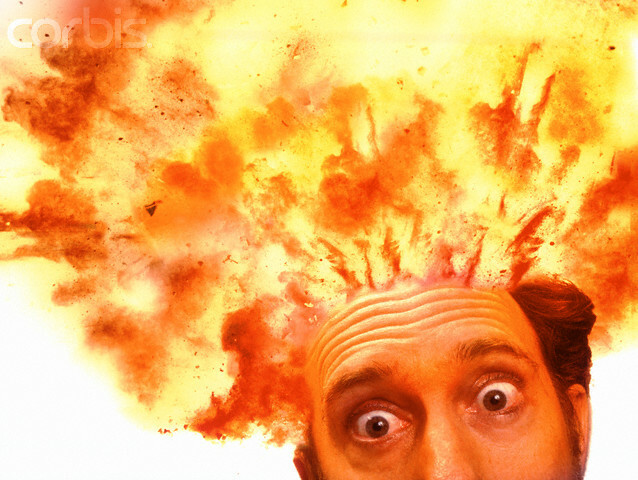 This picture is how my head felt at 4:00 pm when I was thinking about my learning for the day. Support Sky High Writing (3-8) with Shana Frazin to count as a very public “self-assignment”. “ouevre” – collection of works Eve Bunting (tackling tough topics) and using Yard Sale as our demo! The teacher chooses text, places, action and the kind of action we want the students to DO in the text. As a tool it reveals to you when the students think it is worth stopping and sets the stage to work with secondary characters and their relationships! Students can use any prompt to “talk/discuss”. Students are listening differently for the “shared interactive read aloud”. The teacher looks at data to determine what does particular reader, club, or partner need to work on (could be Turn and Talk) and the teacher assigns the role for multiple practices. Process: The student receives a card with the role. Student focuses on the card as the teacher is reading. Our group role card said: “Change – characters and their feelings, traits, lessons learned or not learned, setting, and tone” Our task was to talk about the part of change we could see in the text that had been read. “Reading Mentor Texts Like a Writer”! and we were using ideas from a chart based on Ralph Fletcher’s thinking. “Stop in the name of reading like a writer” – Students choose places to stop and name writing craft. Again, specific assigned roles on cards for partners/tables to respond to. What data will I use to determine whether I am “Reading Like a Reader” or “Reading Like a Writer”? Will I use the set of 3 “Reading Like a Reader” before the 3 “Reading Like a Writer” each time? Will this be “Black and White”? What other considerations should guide my thinking? 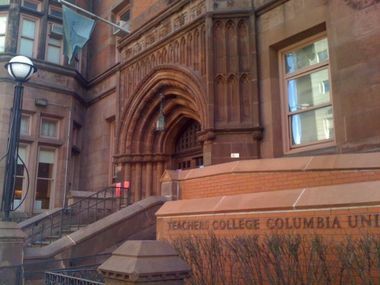 Obviously, I am still at the “new learning stage” but I love the whole concept of “Writing Under the Influence” as well as “Thank you for coming to class today!” I feel totally blessed, as an educator to be at Teachers College learning from and with so many talented teachers! Where’s some inspiring learning about writing this summer? What will be this summer’s highlight? Follow #tcrwp for inspiring tweets all week long! Well, the June 2014 week of Writing Institute ended one month ago. The finale included a “flash mob”, laughing and crying, and singing. Memorable. Unforgettable. How do we have evidence of our growth? We wrote. We wrote some more. And even more. We wrote again and again using the lessons that we were practicing orally and in writing during our sessions. Here’s just a view of my drafts. What patterns do you notice in the drafts? “Writing isn’t really important if it’s okay to write poorly. Writing should be high quality or don’t even bother asking students to write.” Mary E quote to begin June Writing Institute 2014. But students have to write at school. There are 10 writing CCSS ELA Anchor Standards that specifically address writing. Under reading, 4-6 also address the craft of writing. Writing is important. Writing – what do authors use for beginnings? A title – promise of the author to the reader. Provocative beginning– engage, pull them in so they want to write, yet also fit within the context . Delicate balance between student choice and teacher need for compliance – do what must be done! Look again at the titles that Mary chose. How did she arrive at those? How do we begin? Introductions? Prologue? What language about writing would be inviting and engaging for teachers and students? Some ideas. 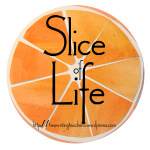 Not a lot of content – YET! DRAFT 2 For MS and HS Teachers in Districts What writing is important? “Writing isn’t really important if it’s okay to write poorly. Writing should be high quality or you shouldn’t even bother asking students to write,” according to Mary Ehrenworth (TCRWP Writing Institute. June, 2014).But students do have to write at school. Is “not writing” a viable option? Not really, because there are 10 writing CCSS ELA Anchor Standards that specifically address writing in all content areas grades 6-12 as well as in the primary grades. To underscore the importance of writing, CCSS ELA Reading Anchor Standards, 4-6 also address the craft of writing. Therefore, writing is necessary and important at school in order to address the standards.The CCSS propose that the three types of writing covered by CCSS.W. 1 opinion / argument; 2. Informational/explanatory; and 3. Narrative are to receive approximately equal attention in the elementary grades. As a student progresses through the grades, narrative writing is de-emphasized and more attention is paid to Standards 1 and 2. Teachers in all content areas are expected to be able to assist students to be better writers within their content expertise. Will they be “teaching” writing? Let’s examine this question a bit farther. Will the science teacher be teaching writing? Yes and No. The science teacher will be expected to read, write and speak like a scientist. The student will use science vocabulary in oral and written work. Lab reports might be one example of expected science writing. The science teacher has the knowledge and expertise to guide the student in reading and writing as an apprentice scientist. The business education teacher will assist the students in reading and writing tasks that would be found within the world of business. Does this mean that every content area class has to now write a term paper? The CCRR Anchor Standards do not say that every class should be writing a term paper but there should be an expectation for daily reading and writing in each classroom, even in small doses. (What changed in this draft? “Writing isn’t really important if it’s okay to write poorly. Writing should be high quality or you shouldn’t even bother asking students to write,” according to Mary Ehrenworth (TCRWP Writing Institute. June, 2014). But students do have to write at school. Is “not writing” a viable option? Not really, because there are 10 writing CCSS ELA Anchor Standards that specifically address writing in all content areas grades 6-12 as well as in the primary grades. To underscore the importance of writing, CCSS ELA Reading Anchor Standards, 4-6 also address the craft of writing. Therefore, writing is necessary and important at school in order to address the standards. The CCSS propose that the three types of writing covered by CCSS.W. 1 opinion / argument; 2. Informational/explanatory; and 3. Narrative are to receive approximately equal attention in the elementary grades. As a student progresses through the grades, narrative writing is de-emphasized and more attention is paid to Standards 1 and 2. 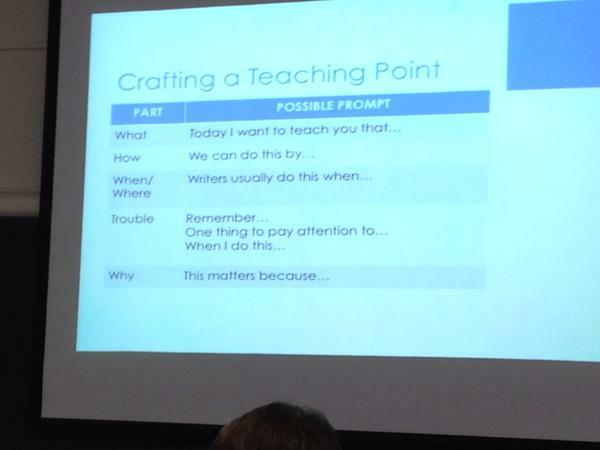 So what will ELA teachers teach about writing if content area teachers have to teach writing? 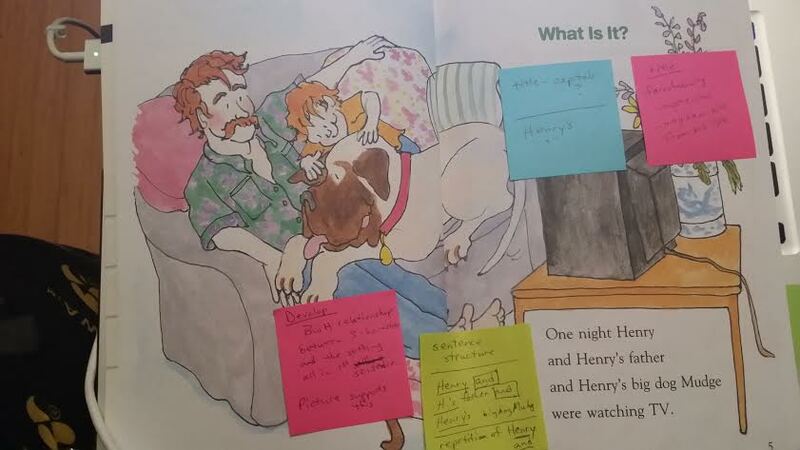 Picture this: Suzie Q is an ELA teacher who LOVES, LOVES, LOVES narrative writing. She has her students write narratives at the beginning of the year, then she adds in some response to reading, some argument and informational writing. But a review of her lesson plans and her curriculum map show that Suzie’s students spend 23 out of 36 weeks on Narrative Writing. Or picture this: Janie Smith is an ELA teacher who prides herself on giving students choices in what to write. She begins the year with a unit on each of the following writing genre: narrative, response to reading, argument, and informational writing. Each of these four units are approximately four weeks long and are typically completed by the end of the first semester. 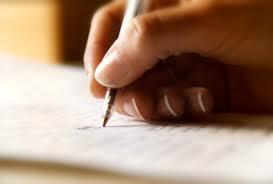 During second semester, students can choose their own content to write based on their other course assignments and needs, yet they know that each student will be asked to add at least one more piece of each writing genre to their portfolio collection with a reflection about how it is different from their first semester writing. Katie Clements, TCRWP staff developer, shared these three common predictable patterns of difficulty in Informational Writing for students in grades 3 – 8. By being aware that other students have had these problems, you yourself can be prepared to plan for a mini-lesson or at the very least to have conference around these issues. What and how you teach will be built on previous writing instruction in your classroom, but see if any of these ideas spark your thinking! What changes did you note in Draft # 3? What questions remain unanswered for the reader? Over the course of a week, what did you see change? Only fitting to share this as my Slice of Life this week: Evidence of Learning at the June Writing Institute 2014! Do you save your drafts? How do you know your writing is improving? What are some goals for information writing? 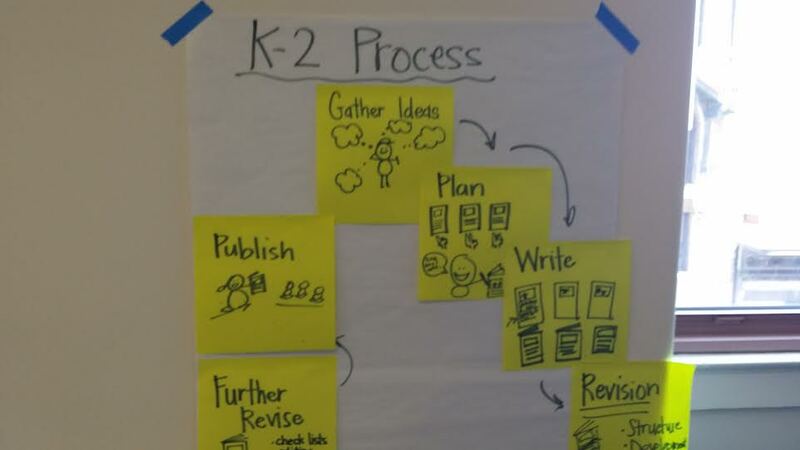 Here’s a look at just 3 of the goal areas that we explored during the June TCRWP Writing Institute. If you are fortunate to be attending an advanced institute in August, you will have an opportunity to see these materials up close and personal. If you have the new middle school units, you already have these materials in your hands. First of all, understand that we were a group of educators representing grades 3-8. Some of these ideas were familiar in texts that we read. But many of them were unfamiliar when thinking about “using them” in our own writing. Identifying how and why “authors” used these goals was an important first step for “Reading like an author” before we practiced these in our own writing! 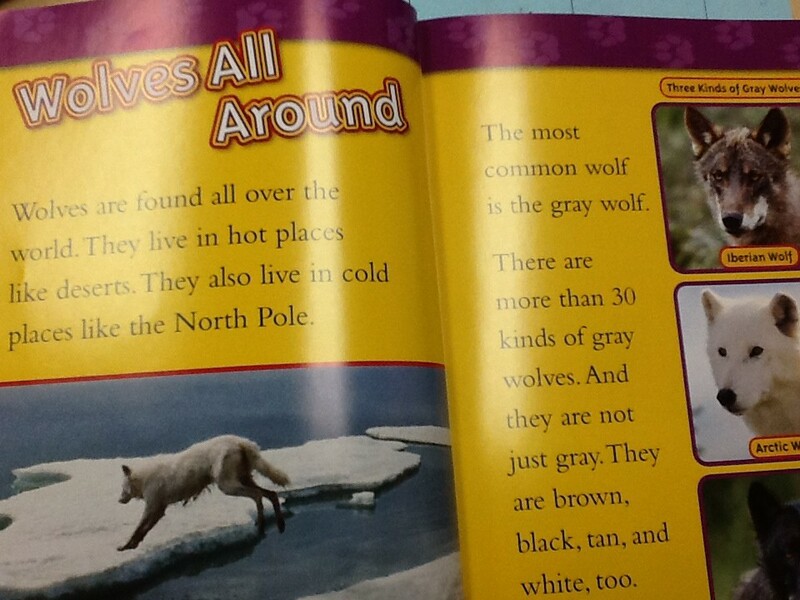 Our reading study was around wolves. Here is one text that we used and the first three of the goals that we talked about. Our first task: Look to see how this author met Goal #1 Hook the Reader. We turned to the double page spread of the text (pages 1 and 2). What hooks you the reader? Which technique(s) help the writer meet his goal? The actual “stance” of the wolf? 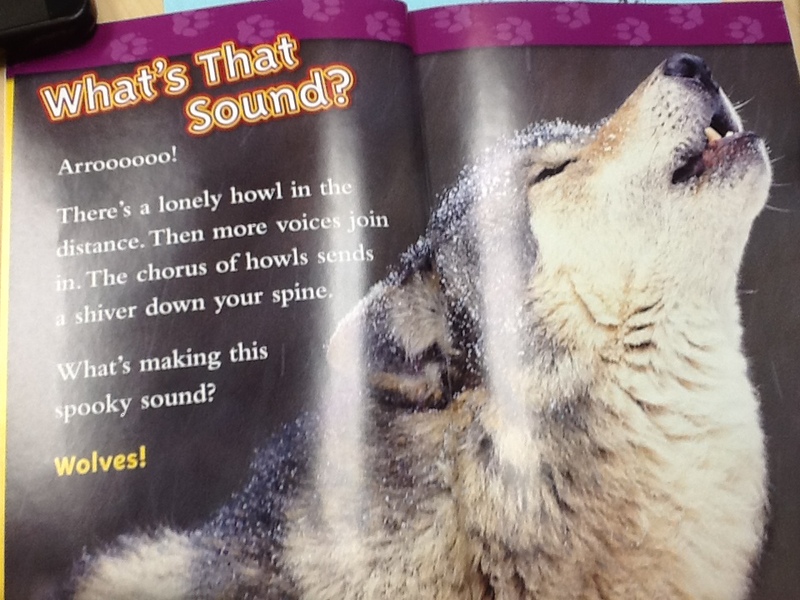 Is it the description that includes the “lonely howl”, “more voices”, and “chorus of howls”? Is this dull, boring information writing? 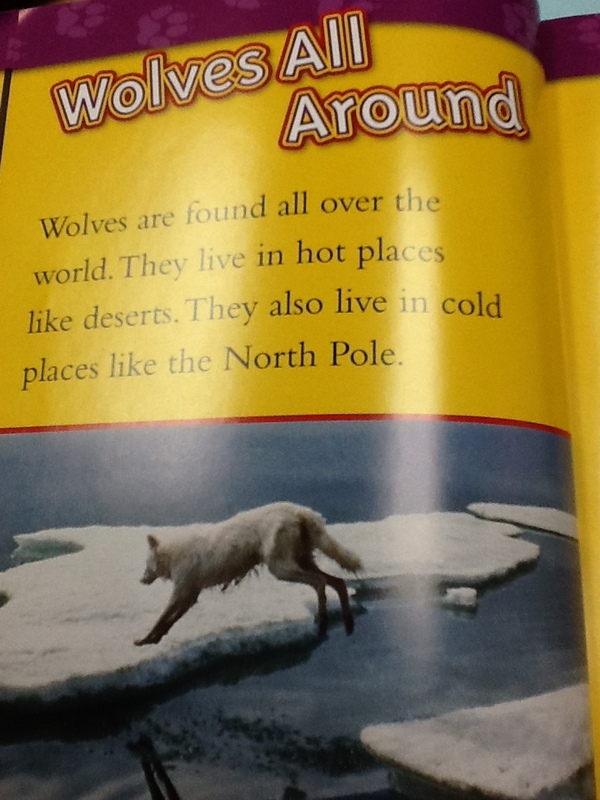 Is “Wolves All Around” a new subtopic? Does this page meet that goal? What techniques help meet the goal? Is it the fact that the “print format” of the heading is now predictable? Is it the placement at the top left of the double page spread? Again, is this dull, boring information writing? Read this double page spread. Does the information qualify as background information? Was this dull, boring information writing? In all of these examples, multiple techniques were used to ensure that the reader understood what the writer was saying. 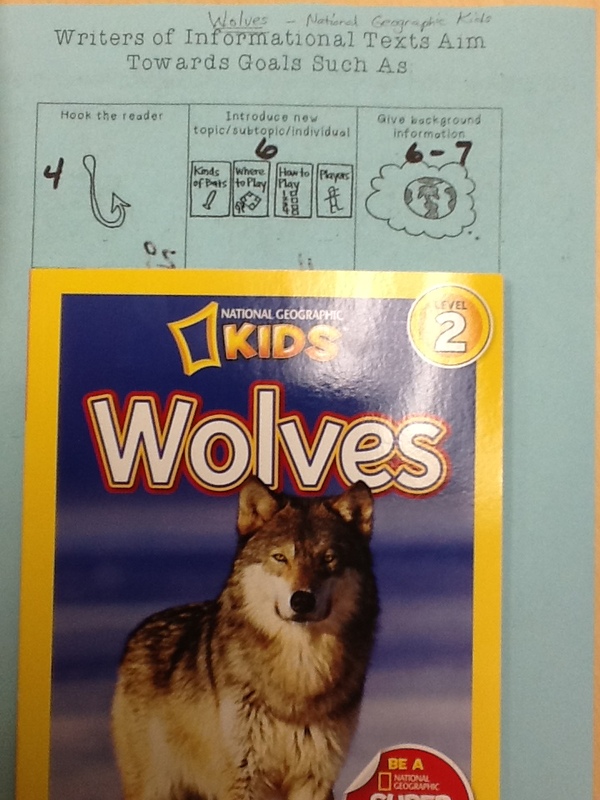 These combinations included words, phrases, sentences, illustrations, headings, titles and additional print features. As expert readers, are we paying attention to the cumulative effect of ALL of those techniques? How do we share that expertise with our students? How does reading like an author and writing like a reader produce riveting informational text across all content areas? How do you teach students to “effectively select, organize and analyze content”? Mary Ehrenworth’s (@MaryEhrenworth) Closing Workshop on Day 4 of June 2014 Writing Institute was named, “Role of Debate in Your School and Across the Curriculum” in the Trail Guide and it totally lived up to its name! From the opening, Mary encouraged participants to stagger the study of debate across the curriculum so that students would have enough opportunities for repeated oral practice to be successful later in writing. What is the Progression of a Debate? What are Some Different Kinds of Debate Topics? Application: Which of these are you currently using? Which ones would you consider adding next? What is the Role of Debate? Application: Of all of these, which will you take back to your colleagues? What Debate Tips Will Help You? How does this vision of the role of debate match your reality? Today began with a one hour keynote by Lucy Calkins in Riverside Church. Articulate, passionate, and enthusiastic about the role of writing in thousands of years dating back to the cavemen, Lucy’s speech was titled “Achieving a Re-set”. 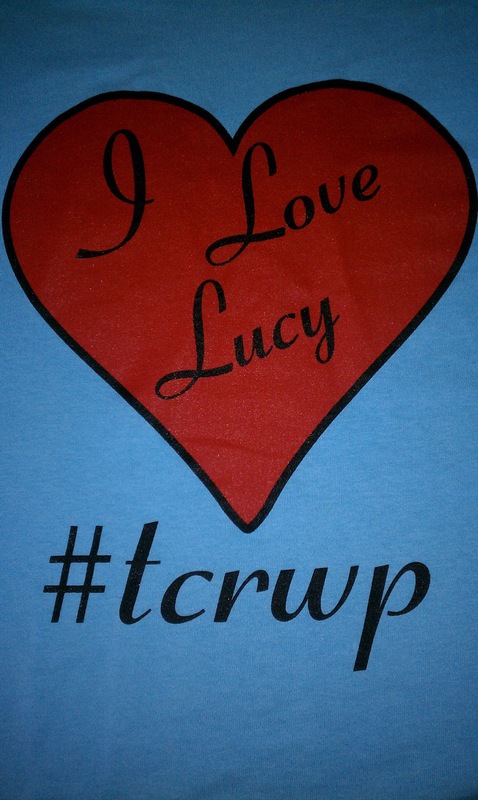 If you are on Twitter, you can scroll through the tweets from #TCRWP for any that mention “Lucy, LC, or LCalkins” to see the quotes that were most often retweeted! In typical Lucy fashion, she exhorted the 1200 strong participants from 34 countries and 44 states to remember their own life themes as they shape the future of schools across the world. Student writing and conversation dominated the keynote as both written words and video from student conferences were shared. Writing, Students, Instruction – Who should have a voice? A speech that began with ” I am blown away by the sheer miracle of your presence. You are willing to give your life to it!” provided much to think about! What a wonderful world it is! My Advanced session with Mary Ehrenworth is entitled “Reports, Nonfiction Books, Journals, Feature Articles, Information Writing and ELA Across The Day” and has already exceeded my expectations for the week. We will be crafting our own progression in information writing this week. Why do we write informational text? 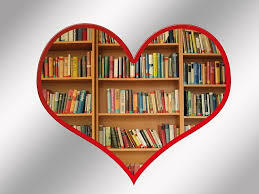 Makes meaning of the world and deepens your own knowledge – really learn stuff & hold on to it forever! Being able to teach something you know to others! You might discover you’re good at it! And then in the spirit of inquiry, Mary read openings from the following books so we could consider how they began. What are moves that writers make, that we’d love to try? was the question that we were trying to answer. What would you say those texts have in common? How are they different? Rebecca Cronin hosted an optional lunchtime workshop for Tweeters and Bloggers. Meeting face to face is always a pleasure and showing “columned” tweeting aids like “Tweetdeck” were useful to the crowd gathered to eat lunch and tweet a bit. Chapter 4 . . .
My small group session session with Emily Smith is “Seeing Patterns in Student Work, Then Teaching Small Groups (and More) to Build New Habits and Skills.” We have already begun to improve our coaching skills as we use a “Research, Decide, Teach” model to respond to our partner’s writing from our writing sessions. Not only should we be noticing patterns in writing, but we should also be looking for disruptions in writing. Where does the writing fall apart? Being able to generate questions and possibilities will help our students make growth! Chapter 5 . . .
And then the choices for closing sessions were daunting. Limiting oneself to one presentation was difficult but I ended up going to Katie Clements’ “Don’t Teach Empty Handed: Toolkits that Can Help You Teach Explicitly, to Scaffold and to Keep Track.” Enthusiastic, knowledgeable, organized and so talented, Katie led us through a discussion of WHY we needed a toolkit, HOW to create one, and how BEST to use one. Citing a personal favorite of mine, Brian Cambourne, Katie shared that often in writing, demonstrations live in mini-lessons, so students only see them on on one level. Many writers would benefit from demonstations on their own level. The solution is to create a writing toolkit to help students! What are some predictable writing problems or needs for students? What are some other common writing difficulties for your students? What conference is repeated the most? Having your toolkit ready now (not waiting for it to be PERFECT is the key according to Katie!) 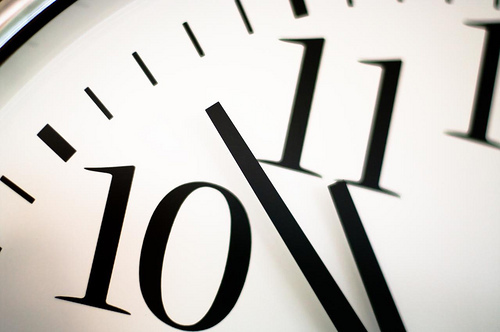 will help you get the year off to a good start! Practical, doable, and so engaging for working on writing revision for students! 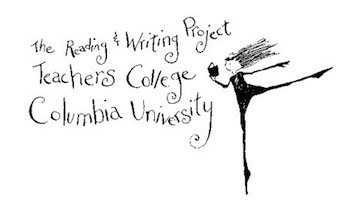 What were your “Take Aways” from Day 1 of the Teachers College Reading and Writing Project’s Writing Institute?